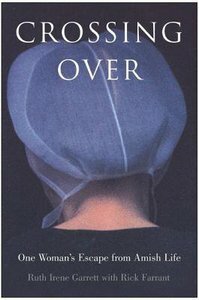 The true story of one woman's extraordinary flight from the protected world of the Amish people to the chaos of contemporary life Ruth Irene Garrett was the fifth of seven children raised in Kalona, Iowa as a member of a strict Old Order Amish community. She was brought up with rigid rules and intense secrecy in a world where the dress, buggies, codes of conduct, and way of life differed from that of other Amish societies a mere one hundred miles away. Her community uncompromisingly avoided all interaction with "the English"-everyone who lived on the outside. As a result, Ruth knew only one way of life, one way of doing things. This compelling true tale offers a striking look inside a hidden community as a woman comes to terms with her discontent and ultimately leaves her family, faith, and the sheltered world of her childhood. She bravely crosses over to a new and unfamiliar reality in hopes of better understanding her emotional and spiritual desires. The result is a powerful and inspiring story-a search for meaning and the extraordinary lessons learned along the way. A work Booklist called Living and life-affirming, Crossing Over is the true story of one woman's extraordinary flight from the protected world of the Amish people to the chaos of contemporary life. Garrett left the Amish faith and her family in 1996 and was ultimately excommunicated from the Amish church. Since that time, she has fully immersed herself in modern life. She married Ottie Garrett, joined the Lutheran church, learned how to drive, and has earned her high-school degree. She looks forward to attending college. Farrant is an award-winning 28-year veteran of newspapers and magazines. He is also the former public information officer for the Montana University System. Currently, he is an editor at The Journal Gazette in Fort Wayne, Indiana, where he oversaw a heralded series of stories on the Amish.